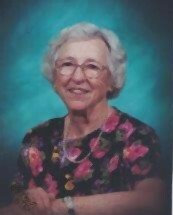 Helen Heck Webster, 99, of Roanoke, Va., entered into heaven on Saturday, January 19, 2019. She was born on May 3, 1919 in Dot, VA. Helen was a retired R.N. from the VA Medical Center. She was preceded in death by her husband, Howard O. Webster. Left to cherish her memory, Howard T. (Tommy) Webster (Carol), Sandra W. Harper (Alwyn), Arlene W. Christenbury (Joe), Nadine W. Donahue (Danny), and Charles H. Webster (Kay). Also seven grandchildren, Chris Webster (Melinda) , Lory W. Hurd (Jason), Patrick Harper (Jessica), Kelly H. Verity (Clint), Kimberly D. Tresky (Billy), Chad W. Donahue, Matthew Webster (Karen) and eleven great grandchildren. We wish to thank each of her past and present caregivers. In lieu of flowers, the family requests any donations be made to the West End Center, 1223 Patterson Ave. Roanoke, Va. 24016 or West End Presbyterian Church, 1200 Campbell Ave. Roanoke, Va. 24016. Funeral services will be private.